This guide is a set of recommendations only. 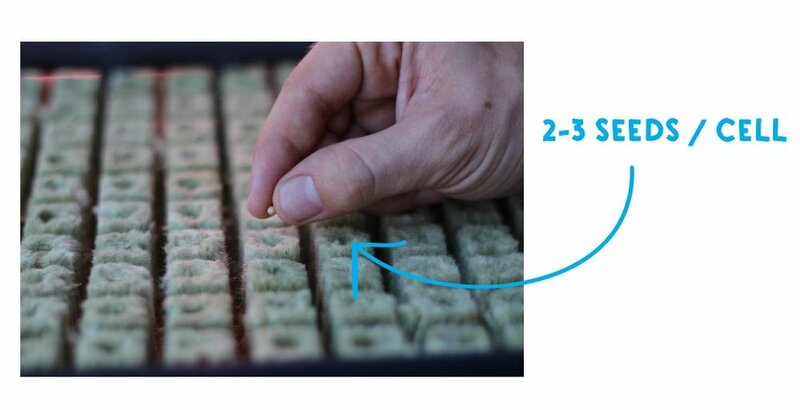 Each +Farm is going to be operated in different ambient conditions, and growing different combinations of plants. The best way to understand how to manage your farm is through a combination of observation, taking notes, and trial & error. Use the information in this guide as a starting point but adjust it based on the specific conditions that pertain to your +Farm. NFT stands for Nutrient Film Technique. This system is great for growing greens, lettuce, microgreens, herbs, strawberries and other smaller stature plants. Your system has enough capacity for 72 plants at a time. NFT systems work by delivering a thin stream of nutrient solution along the bottom of the grow channel. Roots will grow along the channel taking advantage of the nutrient rich solution and ample oxygen available. The challenge of an NFT system is that you have lots of channels and each one needs to have water flowing in and out. So, it’s important to check your system daily to make sure water is flowing well in all channels and isn’t leaking as it exits each one. 5. Check on seedlings each day, adding water to the bottom of the tray so that there is at least ¼“ of water. If your seedlings are on a cement floor, make sure to put a layer of insulation under them (this can be foam, carpet, cardboard or other isolating material). 8. Once seedlings are exposed to light, it is important that they also have nutrients to be able to grow well. Seedlings should be given a highly diluted nutrient solution. A solution that is too strong will likely kill seedlings. Prepare a nutrient solution with an EC of 0.5 or less and use this to feed your plants. Put about ¼” of solution in the bottom of the tray. Each day top off with water and then add a bit more nutrient solution as needed (measure EC). If you aren’t measuring your EC, be very conservative in adding nutrients. It is easy to kill plants with too strong a solution. Follow instructions on fertilizer package. Once your plants are ready to transplant, simply pop out and separate the cubes and transfer them to the channels. Place one per hole into each of the 72 holes on the channels. Please note: If any plants do not look healthy, do not transplant them into your +Farm. Pests and diseases can spread very quickly in the +Farm so it is best to never introduce pests or diseases if possible. Dispose of any plants that appear to have diseases or pests. If you are in doubt, please toss them out. Fill your reservoir with cold water and then turn on your system pump. Allow water to circulate through the system for at least 30 minutes to make sure everything is functioning correctly. 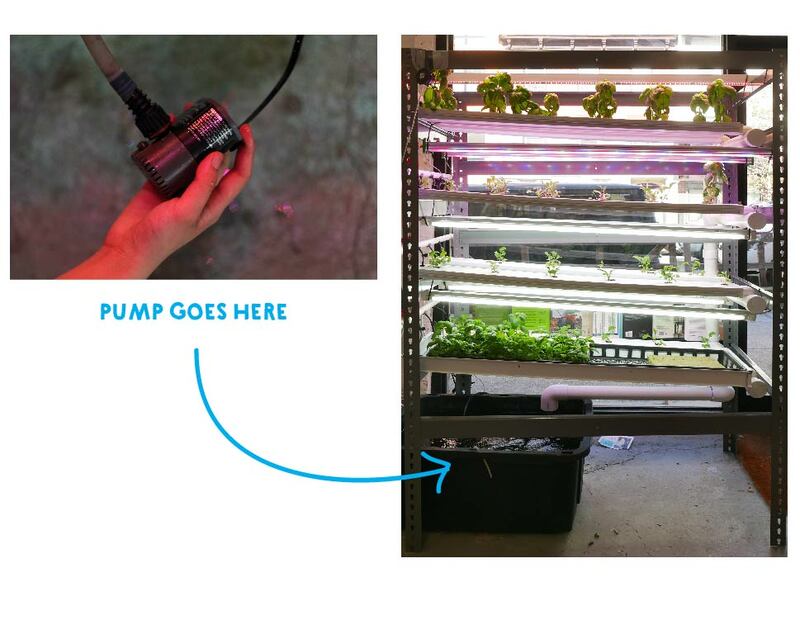 The pump that is located in your reservoir circulates water throughout your +Farm grow beds. This water carries important nutrients and oxygen to plant roots. For this system we recommend that your pump cycles on and off. Research has shown that certain crops yield better with an on/off approach. Begin with running your pump for 30 minutes and resting for an hour. Make sure your plants are not drying out. Observe your plants using this on/off regimen and adjust based on your crops and conditions where your +Farm is located. 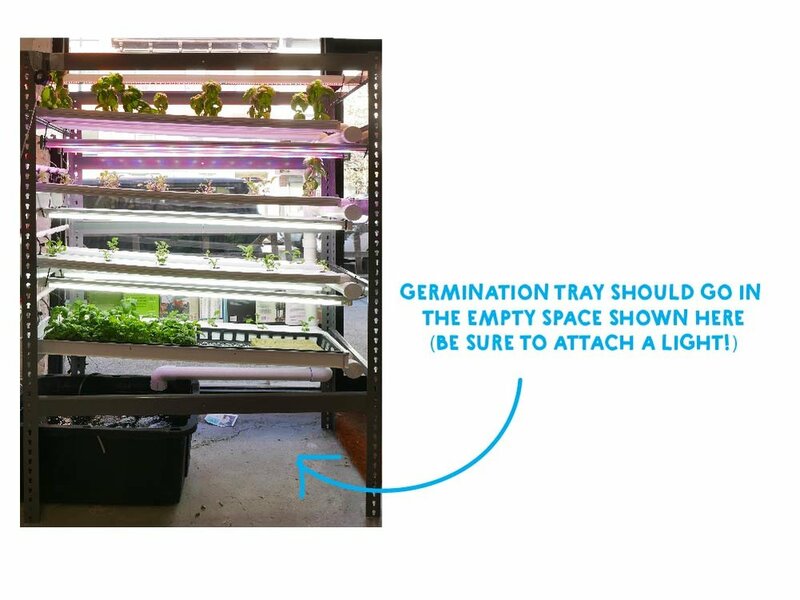 Your +Farm may be located in any one of a number of places - classroom, living room, greenhouse, closet, garage - the possibilities are endless. Each of these locations presents a set of specific environmental conditions. To thrive, the +Farmer needs to be aware of and understand these conditions as much as possible, and make adjustments to the +Farm in accordance to these conditions. After several weeks, your plants will be mature and ready for harvest! Some plants can be continually harvested using the “cut and come again” method. You may have to cut your plants out of the channels if the root mass is overgrown to avoid damaging the plant. To clean the system, the main task is scrubbing with a scouring pad to remove algae and other debris. Add warm water (and a small amount of dish soap if desired) to make cleaning easier. Make sure to take the pump apart and rinse out all gunk in pump and clean the filter (this is easiest to do in a sink with a spray nozzle). Rinse channels well after scrubbing to remove all debris. If you have seen any signs of disease in your system, you should follow your cleaning with a hydrogen peroxide flush. The point of a flush with hydrogen peroxide is to inhibit disease that may be in the irrigation lines or the pump. Take a plastic 5 gallon bucket and fill halfway with water. Add one bottle of 3% hydrogen peroxide (available at most grocery or convenience stores). With a sponge, wipe all bed surfaces with the liquid. Then, disconnect and remove pump from reservoir and place in bucket to soak for at least 5 minutes. With pump oriented sideways or upside down, turn pump on and allow peroxide flush to circulate in bucket. Finally, dump flush into reservoir and reconnect pump. Turn pump on briefly to flush irrigation lines as needed with hydrogen peroxide solution. Once cleaning is done, dispose of this water in a floor drain, sink, or toilet. Finally, refill the reservoir with water, add nutrients, balance pH, add plants, and turn on the pump and lights again. Always monitor your system after cleaning to make sure everything is working properly, there are no leaks and there is sufficient water. Note: Hydrogen peroxide is not toxic to plants and can be beneficial by raising the oxygen levels in liquid. 3% hydrogen peroxide may have other chemicals to stabilize it and that is why we recommend disposing of the peroxide mix after running it through your system.